Bosky patches of woodland, open stretches of field, a little pond with waterbirds, cottages in the distance. People walking their dogs, children racing across the grass, a pair on horseback, a quartet of golfers. You might think yourself outside, watching the happy activity on your local common. 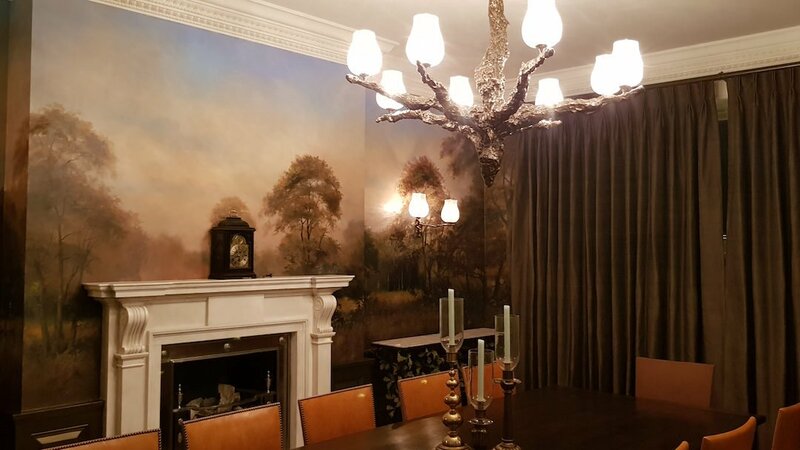 In fact, you’re in the elegant dining room of a unique London residence and the vibrant scenes around you are all the work of artist and muralist Michael Alford. In this interview he explains how he came to paint this immersive large-scale mural to the specifications of his art-loving clients. “The landscape was my inspiration.” Michael Alford with the Woodland mural. MA: It was a lucky accident. The clients owned a painting of mine and had commissioned another—an external view of their home. They didn’t know I was also a muralist. 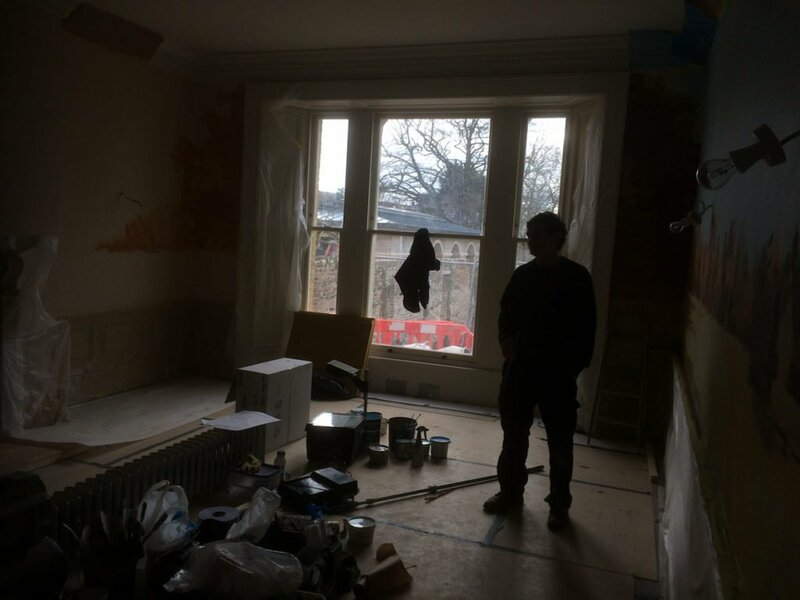 One day, when I dropped by to deliver a painting, they told me they were embarking on a large-scale refurbishment and were looking for someone to create a hand-painted dining room for them. Could I suggest anyone? At that point I showed them some of my past projects and they were keen to go forward with me. 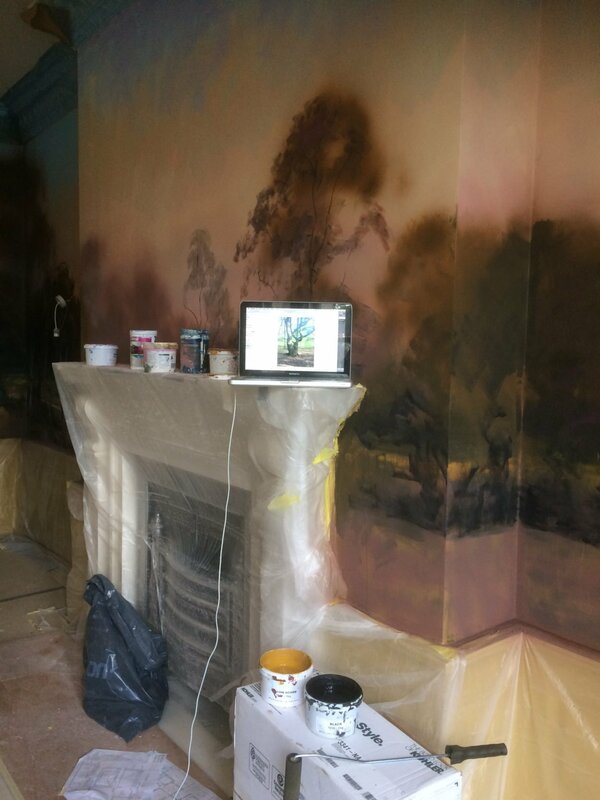 How did you hit upon the concept of a woodland mural? MA: It came from the clients. They had very clear ideas from the outset. They wanted a mural of views of their local common, a place with special meaning for their family. They wanted the scenes to unfold around the room from morning to evening, showing the common at different times of day. Apart from that, they gave me a very free hand. MA: I’d already done many sketches and larger paintings of the common and the views they had in mind. I knew the subject well—the layout, the types of trees, the colours. I also wanted to include some lively figures in the mural, and those also came from sketches I did on the common at different times. So the landscape itself was my most important inspiration, but I was also influenced by a series of panels by the 19th century painter Corot, The Four Times of Day. Corot made them for an artist friend and later Lord Leighton owned them and displayed them in his house in Holland Park. They are definitely painters’ paintings and they helped me formulate my ideas. They capture the exact effect of changing light and mood I was after. How did you coordinate your mural with the interior design? MA: It was the clients who brought me into this project, but I worked closely with the designers, Studio Indigo, at every stage. They took their lead from the painting, which is the best approach, and found textiles and materials that work well with its tones and colours. The lighting fixtures and furnishings were specially commissioned to be in keeping. The room was even fitted with two bespoke jib doors that allow the mural to flow uninterrupted. I think they did a wonderful job of adapting the room’s overall decoration to complement the mural. Can you describe your painting technique? MA: I first produced a rendering of the overall scheme using a digital painting program. This helps me work out the overall plan and see how it looks in a 3-D model of the room. I presented this to the clients and the interior designers for feedback. When I was able to get on site, I roughed out the whole scheme in water-based paints. I use rollers and big brushes at this stage and even a spray gun. I do this to establish the overall layout of the mural—in a large space you have to try as much as possible to work on everything all at the same time to keep the tonalities even. That rough schematic full-scale sketch is absolutely vital to getting a surface on which you can elaborate detail. Once the scheme is blocked out, I then begin to work on the detail using oil paint and finer brushes. This is the more subtle finished work you see in the final product. MA: I’m really happy with it! It looks particularly good in the evening. They’ve put in an elegant set of curtains and beautiful lighting for the room, too. The clients are happy, too. That’s the main thing. Building work complete: Painting work begins. Blocking out forms and tones using a broad brush approach is a key stage when painting a large-scale mural. Tech and trees: The laptop proves handy for reference images. Details and subtle modelling is done with fine brushes in oil. Bespoke sconces provide sophisticated lighting. Riders. The inclusion of active figures brings life to the mural landscape. There’s always room for one more. A friend with a cup of coffee. Triclinium: The mural wraps three sides of the room, with the fourth French windows into the garden.